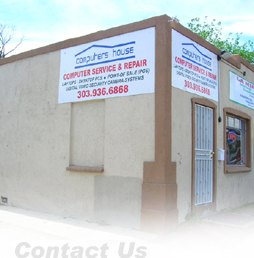 Computers House is a locally and family-owned business in Denver, Colorado. In addition, we are a retailer of point-of-sale (POS) and digital video recorder (DVR) security systems. We have over 20 years of combined experience in the field of IT and electronics. We can fix just about anything and guarantee the lowest rates around. There are no “geeks” here, just people who have expert knowledge and perform expert service. Many computer repair shops purposely do not list their rates OR they charge you extra for just looking at your computer. Here at Computers House, we openly list our fees to ensure that our customers will receive the best flat-rate price possible. There will be absolutely NO hidden labor charges and all work or part orders will require your authorization prior to being completed. Also, if your work order requires a part, we will search for the lowest cost and highest quality components. Finally, we offer pickup and delivery service for the entire Denver Metro area. We guarantee your utmost satisfaction. Most of all, we can and will fix ANYTHING at the lowest rates in town.